Adjusted the status images to use the same lighting as the rest of the theme. version 2.1 is out now. changed the status images so they look quite a bit nicer now. when I tried to open it got a failed instilation message "Sorry, but Adium Message Styles are not supported in OS X 10.2 (Jaguar) at this time." That's an issue with Adium and beyond my control, unfortunately. Why did you make this? That bevel took you 2 seconds. MY EYES. the light source is from top-right on this. That's inconsistent with everything else on the screen which is top-left. other than that, I like this theme. I agree with bob_the_gorilla - the new bevel rawks. I like it. Those buddy icons in the screenshots are cool too! Would you mind if I used the little icon thing for this add-on as my buddy icon? Thanks! I won't, and no one will think I did since I am really bad at graphics ;) Wow, that buddy icon goes perfectly with the buddy list! I think I have a message layout somewhere that it will go with too. great work! something i noticed though if a contacts alias runs over a single line in the title space it infriges below on the actual message type. I have tried readjusting the window but then it ran over the bevel. Id rather not adjust my window to suit the longest names anyway. I love the look and just got 3.1! unfortunately, as far as i know, i can't do anything about it as far as the theme is concerned. it's something that's a problem w/ adium itself. it's weird that it wouldn't fix from increasing the window size seeing as how i have the images set to go up to 1600px wide... unless your current resolution isn't high enough. anyway, there's not really anything i can do about it, unfortunately. if anyone knows of a way to get around this, please let me know. 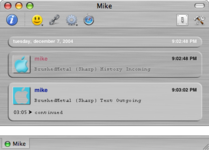 How do u do to have also the window in brushed metal ? 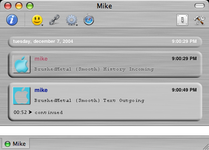 I only have the chat zone in this, but the preferences and the windows still are in comon type (white). it's the OSX theme by Max Rudburg. Click the link in the description to go to his site and you can find it there. If you're using Panther you'll need to use an application called ShapeShifter to use the theme.